C0750. ALEXANDER GAUK Cond. Moscow Radio S.O. 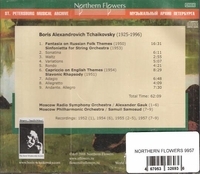 : Fantasia on Russian folk themes; Sinfonietta for string orchestra; Capriccio on English themes; SAMUIL SAMOSUD Cond. Moscow Phil. : Slavonic rhapsody (all Boris Tchaikovsky). (Russia) Northern Flowers 9957, recorded 1952-57. “Samuil Abramovich Samosud was the Principal Conductor of the Maly Opera Theatre from 1919 to 1936. He conducted three world premières here: Shostakovich’s THE NOSE (1930) and LADY MACBETH OF THE MTSENSK DISTRICT (1935) - both interpretations were acknowledged as exemplary by the composer - and Prokofiev’s WAR AND PEACE (1946, 1955). Samosud also collaborated with director Vsevolod Meyerhold on a new version of Tchaikovsky’s opera THE QUEEN OF SPADES (1935).